The scene of the attack on Saturday. The Ahvaz National Resistance, a little-known group with roots among Iran’s Arab minority, claimed responsibility for the attack, as did the Islamic State. Soldiers in dress uniform lay prone in the street. Others, apparently heavily armed, faced the assailants, then threw themselves to the ground without firing back. Some just ran for their lives. Captured on video and widely shared on social media, the attack over the weekend on an Islamic Revolutionary Guards Corps parade in Iran was a humiliating blow. A local Arab separatist group claimed responsibility, but Iran said the perpetrators were backed by Saudi Arabia, the United Arab Emirates and the United States. On Monday, Iranian officials vowed revenge against all three countries and Israel. The attack has escalated tensions between Iran and the Persian Gulf states and their American allies. The Trump White House has taken a hard line against Iran, withdrawing from a nuclear agreement and imposing sanctions that have damaged Iran’s flailing economy. Saudi Arabia and the United Arab Emirates have clashed with Iran over Yemen, Qatar and Syria. The conflicts are expected to take center stage at the United Nations General Assembly this week. The attack on Saturday in Ahvaz, Iran, killed at least 25 people, including some children and other civilians who had been among the spectators, according to Iran’s state news agency, IRNA , and a dozen members of the elite Revolutionary Guards. A widely posted image on Facebook showed members of the Revolutionary Guards military band, wearing tricolor sashes and carrying musical instruments, hiding in a drainage ditch — described by many commenters as a sewer — during the attack. Iranian officials, including the country’s supreme leader, Ayatollah Ali Khamenei, focused blame on Arab kingdoms on the Persian Gulf, as well as the United States. “This cowardly act was carried out by those who are rescued by Americans wherever they are entangled in Syria and Iraq and their hands are in the Saudi and Emirati pockets,” Ayatollah Khamenei said on Monday, the Fars news agency reported. The Ahvaz National Resistance, a little-known group with roots among the Arab minority of Iran, claimed responsibility for the attack on Saturday. So did the Islamic State, though the links to that group were ambiguous. It was the worst attack inside the country since an Islamic State-claimed assault onParliament in 2017. Ahvaz is the capital of Khuzestan Province in southwestern Iran, where many of the country’s Arabs live. The Islamic State posted a video that it said showed three of its fighters on their way to the attack, according to IRNA. Two of the fighters were speaking Arabic with an Iraqi accent. The Islamic State claimed responsibility with bulletins on its Amaq news service, which also ran the video of the fighters. But the video did not explicitly say the attackers belonged to the Islamic State, nor did they pledge allegiance to the group’s leader, Abu Bakr al-Baghdadi, as similar claims from the group have done in the past. 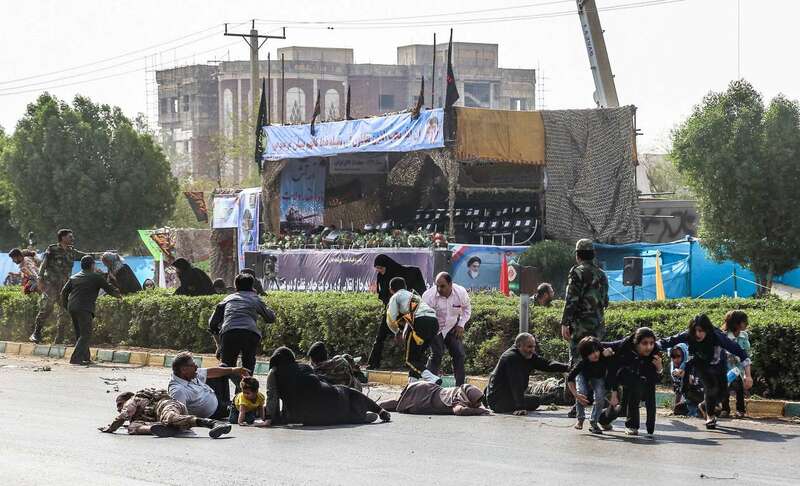 Iranian news accounts said there had been at least four assailants, who disguised themselves in Iranian uniforms and attacked from behind the viewing bleachers at the parade. They said three of the assailants had been killed and one captured. Iranian officials provided no evidence that the countries they blamed were behind the attack. The United States and the Emirates issued statements dismissing the accusation. But the attack came at a volatile time in Iran’s relations with those countries. A prominent academic in the emirate of Abu Dhabi, Abdulkhaleq Abdulla, added fuel to that fire by saying the attack had been part of an effort to bring the fight against Iran inside the country. Mr. Abdulla, who has frequently been described as an adviser to the Emirati government and as close to the crown prince of Abu Dhabi, suggested support for the attack in a Twitter post on Saturday: “A military attack against a military target is not a terrorist act,” he said. The Iranian Foreign Ministry summoned an Emirati envoy to complain about Mr. Abdulla’s remarks and warned that the Emirates “would be held accountable for individuals affiliated with official Emirati agencies that show clear support for terrorist acts,” the ministry said in a statement. Analysts said the Revolutionary Guards, an elite militia that operates independently of the Iranian government, were bound to react strongly to such a public humiliation. The Emirates were not the only regional power cheering on internal resistance to the Iranian government recently. Saudi Arabia had also bitterly opposed the nuclear deal Iran signed with the United States and other world leaders, and it had cheered the Trump a dministration’swithdrawal from the agreement . President Trump’s personal lawyer, Rudolph W. Giuliani, fueled claims of an American campaign against Iran when he addressed an “Iranian uprising summit” in New York on Saturday — hours after the attack in Ahvaz — saying that a leadership change in Iran was inevitable because of United States sanctions . After attacks in Tehran last year, the Revolutionary Guards said that Israel, Saudi Arabia and the United States were responsible, but most government officials blamed terrorists. This time, Iranian leaders described the attack not as terrorism, but as an act of foreign aggression — a significant difference, said Hussein Allawi, a national security analyst at Al Nahrain University in Iraq. Despite the bellicose language from the supreme leader and the Revolutionary Guards in Iran, other officials seemed to adopt a more cautious reaction, at least initially. Speaking at the funeral for the Ahvaz victims on Monday, the deputy commander of Iran’s regular army, Brig. Gen. Nozar Nemati, said it was too early to say whether Western intelligence agencies had been involved in the attack, and suggested it may have originated closer to home. “They are the same people who were followers of Saddam at the onset of the war, and they are pursuing the same goal,” IRNA quoted him as saying . He was referring to the former Iraqi leader Saddam Hussein, who fought a bitter war in an attempt to destroy Iran in the 1980s.